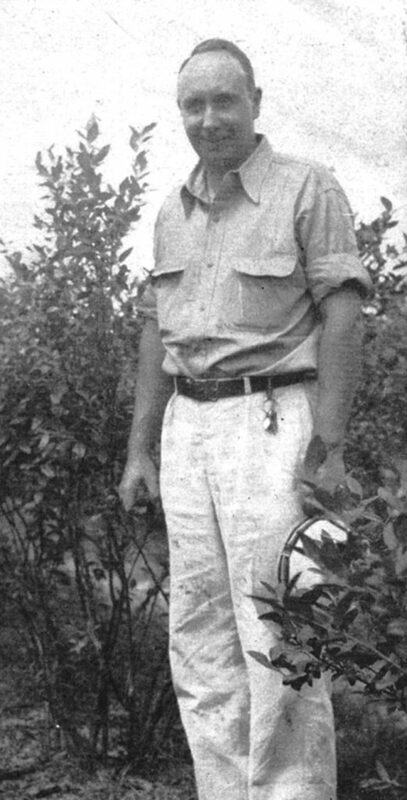 Harold Graham Huntington’s blueberry crop was under attack. It was the early 1940s, and stem canker, a fungus disease native to the Southeastern United States, was withering his Pender County blueberry bushes. The once-green leaves were wilting and turning red and brown. Large cankers with deep fissures and cracks grew on the stems. Huntington needed help. He called researchers at North Carolina State College (now NC State University), with whom he was already working to create new blueberry strains. Together, they set up experimental stations on Huntington’s farm that led to the development of two strains resistant to stem canker. The first was named the Wolcott, after Huntington’s father. The second strain — the Murphy blueberry — was named after a local blueberry farmer. The new strains saved not only Huntington’s crop, but also the North Carolina blueberry industry — which Huntington had helped create. Huntington is the father of commercial blueberry farming in North Carolina. Before he arrived in 1928, the berries only grew in the wild here. By 1939, his Pender County blueberry farm was the largest in the world. The berry backstory began in New Hampshire in 1908, when Dr. Frederick Coville, a botanist for the USDA, started breeding wild blueberries with other plants to create a commercial crop. Over in Whitesbog, New Jersey, Elizabeth White read about Coville’s research and invited him to work with her on her farm. By 1916, their efforts had paid off: The first commercial “highbush” blueberry crop was brought to market. Meanwhile, Huntington, a native of Montclair, New Jersey, was involved with a training farm built to teach agriculture skills to women. He was attending Dartmouth College when he enlisted in the Army Air Corps. He flew biplanes during World War I, but he was always eager to get back to his first love: farming. After the war, determined to start his own farm, he swept floors as a janitor to save money to buy some land in Florida. There, he grew lettuce and celery, but the market was unfavorable, and a frost killed his crops. He returned to New Jersey with blueberries on his mind. Huntington bought a 10-acre farm and started growing blueberries after having a chance to work with White. He invented a new method of cultivating blueberries using raised beds, root stimulants, and tobacco cloth to cover the nursery frame. The method allowed him to produce thousands of blueberry cuttings and save enough money to buy a new farm in the South, where he hoped to grow a crop that would ripen earlier in the year. In 1928, Huntington and his father, Frederick Wolcott Huntington, headed south in a Dodge touring car, looking for land. 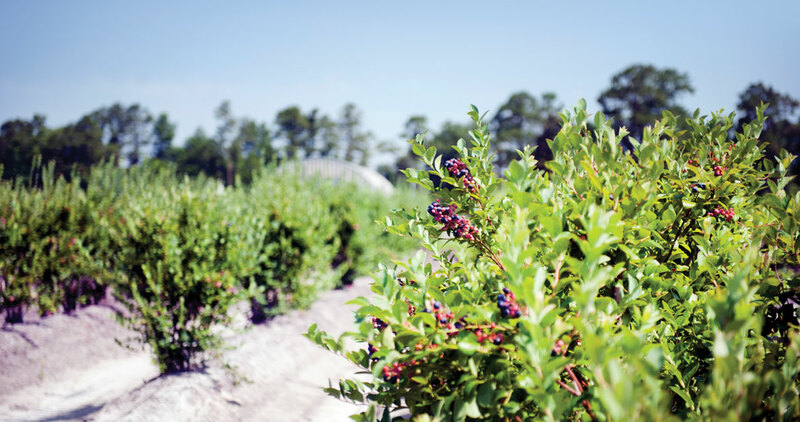 They interviewed farmers about blueberries in the Tidewater area of Virginia before finding the perfect spot in Pender County, where wild blueberries grew plentifully. The reason was in the soil. Huntington purchased more than 1,600 acres between Atkinson and Ivanhoe and started planting, using cuttings he’d grown up north. It takes about three years for blueberry plants to mature; Huntington harvested his first successful crop in 1936. John fondly remembers working on the blueberry farm. His father owned four farms, and the family lived on a dairy farm in New York. But John would come down to North Carolina during the harvest. Out in the fields, an army of pickers worked up and down the green rows, filling baskets with berries. “He employed an awful lot of people,” John says. The pickers returned every year, some working for two decades. John’s favorite place on the farm was the packinghouse, where women stood at long tables filling wooden pint cups with plump blueberries. In the 1950s, Huntington constructed a 30-by-35-foot cooling shed — the first one ever built on a blueberry farm. Before that, the berries were packed and trucked to a cooler in Burgaw. Having a cooler on the farm meant that a day’s harvest could start cooling immediately, lowering transportation costs. Every year, the farm got bigger. 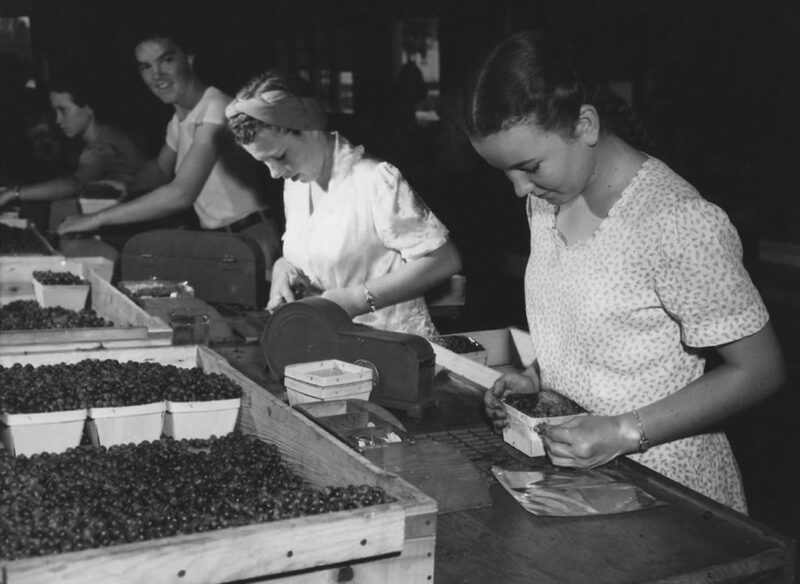 By 1939, Huntington was planting at least 140 acres and running the world’s biggest blueberry farm. Huntington sold the farm and retired in the 1970s, and died shortly thereafter. He was 79 years old. He was proud of what he accomplished, his son says. Huntington may be just a footnote in history, but his legacy — especially in North Carolina — is ongoing with every blueberry harvest.